In winter, Kanazawa bears witness to rain and snow in their myriad forms. The beginning of winter is signaled by thunderstorms reverberating against the mountains. They are said to “awaken” not only the snow (yukiokoshi), but also the shoals of yellowtail (buriokoshi) that start their seasonal migration southward along the coast. The grey of the low-hanging sky is washed with the white brush strokes of large, soft snowflakes known as ‘peony snow’ (botan yuki), blown by the wind from every direction. In the centre of Kanazawa, where the land suddenly rises into the slopes of a plateau, the ancient stone walls of Kanazawa Castle and the trees overhanging them seem traced in the monochromatic tones of ink paintings. On the adjacent hill, some eight thousand trees are hibernating under the heavy snow in Kenrokuen, the castle’s outer garden. Their branches bend with the weight of the snow over the landscaped pathways and ponds. 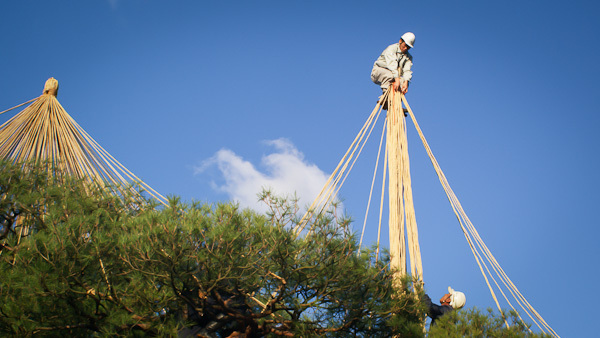 Each year before the onset of winter, poles are erected among the branches of the trees in Kenrokuen and rice-straw ropes suspended from their tops are attached to the branches to provide support against the snows of the Sea of Japan coast. These canopies of ropes, known as yukitsuri, shroud not only the vast aged trees, but also fragile younger trees and bushes. The practice of using ropes to protect the trees in winter is mentioned in records dating from the late Edo period (1603-1868). In addition to preventing snow damage, yukitsuri arrangements add to the aesthetics of the landscape, forming together with the trees elegant architectural structures. 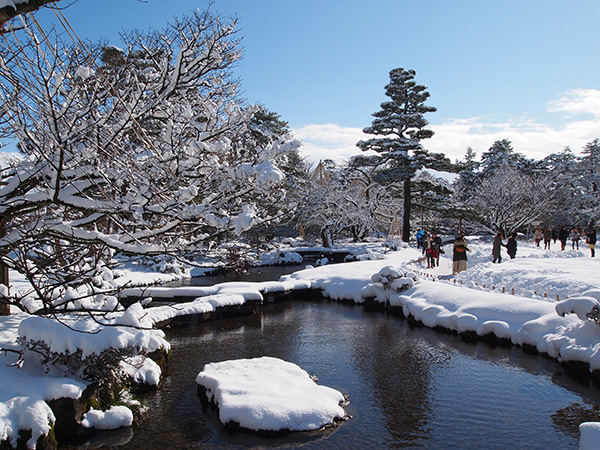 In winter, Kenrokuen garden exalts the spellbinding stillness and purity of snow. The very name ‘Kenrokuen’, meaning ‘Garden of Six Qualities’, is a reference to an eleventh-century Chinese text, which stated that a perfect garden was difficult to achieve because it required the combining of six features grouped in mutually exclusive pairs: spaciousness and seclusion, air of antiquity and human artifice, water features and panoramas. The video featured here is an extract from the “Book of Seasons” documentary and the text is from the new “Biodiversity in Kanazawa” booklet that are part of a multimedia project on biodiversity in Kanazawa that was initiated, designed and funded by UNU Institute of Advanced Studies Operating Unit Ishikawa/Kanazawa (UNU-IAS OUIK) under the coordination of the Unit’s Director, Anne McDonald. 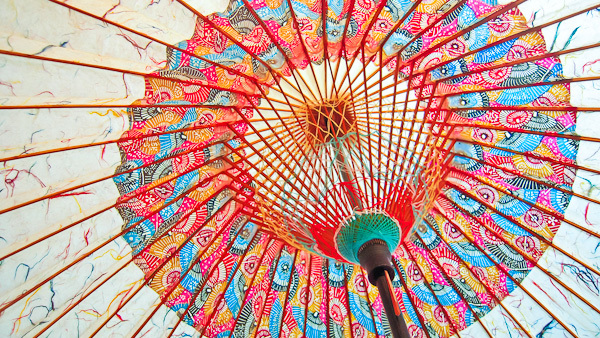 The project creatively “packages” OUIK’s cutting-edge research and explores complex aspects of the urbanization-biodiversity nexus in a form accessible to researchers, students, policymakers and civil society, both in Japan and around the globe. Biodiversity in Kanazawa: Winter’s lesson by Raquel Moreno-Peñaranda is licensed under a Creative Commons Attribution-NoDerivs 3.0 Unported License. A magnificent clip! It captured my eyes and heart so powerfully! Wow, these short films only get better and better. In high definition on my large screen I was simply transported. Stunning, really. A few years ago I visited Kanazawa for a few days and walked into the hills, crossed the bridges, gazed at the koi, and, of course, took lots of photos in Kenrokuen. It was summertime, and I’d wondered how the other seasons would be there. 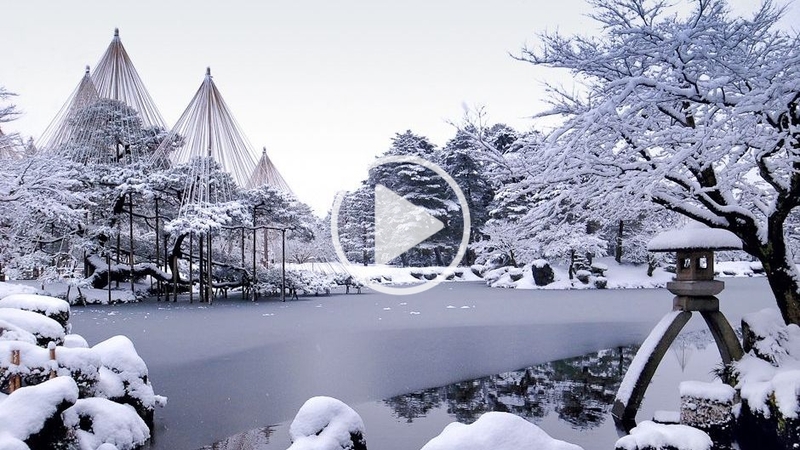 Now, thanks to this video, I have a powerful sense of winter in one of my favorite cities. I’m so looking forward to the next chapter in your Book of Seasons. I do hope it will appear here on OW2.0!